The CX550M is an excellent mid-level PSU for use in basic system builds and desktop PC computer uprades. The CXM Series is available in a variety of power configurations allowing you to power more components if needed. The matt black finish, black sleeved cables and black connectors give the CX450M a high-tech look. The clever thermally controlled fan design allows for little or no detectable fan noise during normal use, this gives an 80PLUS BRONZE certified efficiency rating. 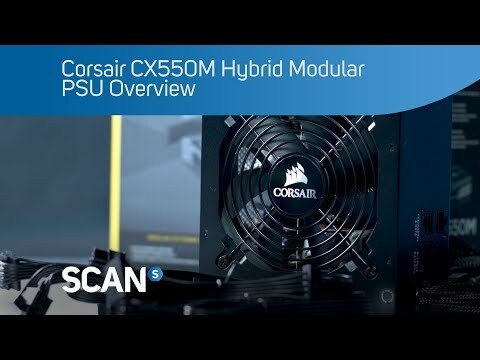 This CX450M has been tested to strict Corsair standards for a trouble-free installation. On the CX550M PSU the peripheral power cables aren’t hard-wired to the power supply, you can connect only the cables you need for your exact configuration of PCI-E cards and storage devices. The rest of the cables stay in the box, and not in your PC’s case where they can add to the clutter and interfere with airflow.